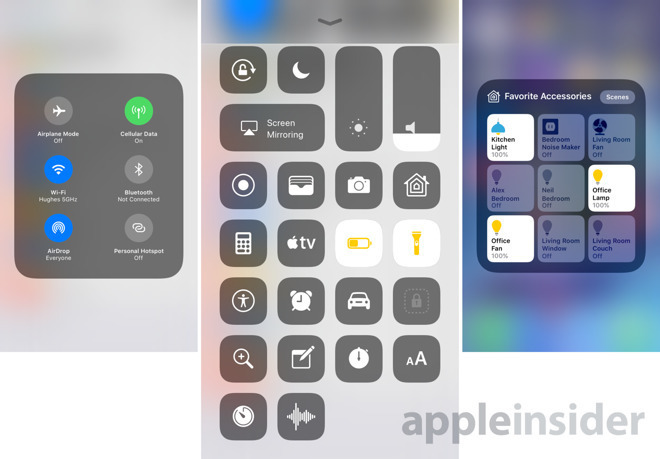 Contrary to intuition, toggling off Bluetooth and/or Wi-Fi in the iOS 11 Control Center won't completely disable those radios, according to a new Apple support document. The only way to completely disable network connections is to toggle them in the iOS Settings app, the document says. Instead the Control Center options simply disconnect any accessories apart from the Apple Watch and the Apple Pencil, so that those first-party products and some iOS functions —namely AirDrop, AirPlay, Continuity, Instant Hotspot, and Location Services —will continue to work. After toggling off Wi-Fi, network auto-join is disabled as well until Wi-Fi is manually restarted, a person walks or drives to a new place, or it's 5 a.m. local time. Bluetooth accessory connections will resume under the same circumstances, minus the location trigger. The scheme could be confusing or inconvenient for some users worried about battery life, security, or signal pollution. Apple made the change during the iOS 11 beta. The support document codifies and explains it however, now that iOS 11 is available to the general public. A redesigned Control Center is one of the focal points of iOS 11. The panel now takes up the entire display, showing more controls at once. Users can also add and remove items, customize their order, and control new functions like screen recording or Do Not Disturb While Driving.